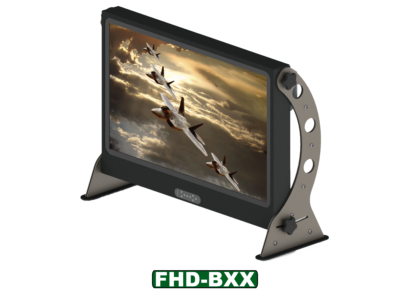 The FHD and UHD series are our full high definition (1920×1080) and ultra high definition (3840×2160) tactical displays. They are built with an aluminum welded chassis,and have an AR/AG protective glass lens. High bright and optical bonding options are available. There are multiple AD controller cards to choose from giving you inputs and features to meet broadcast, military or ultra high end applications. 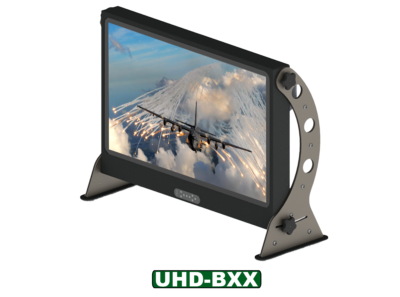 It comes with our flex mount system which includes a VESA mounting pattern on the rear or optional side arm desktop stand as shown. An optional 13 key programable hot keys button array is available also.